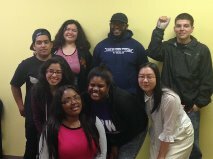 On February 14th, a group of young people gathered at the Chicago Freedom School (CFS) to participate in the inaugural session of the Young Leaders For Justice (YLJ) program. YLJ is the result of a collaboration between CFS and us at Project NIA. 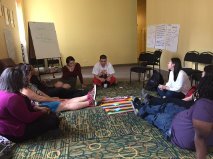 At the end of the 10 sessions of political education (end of June), some YLJ participants will execute action projects over the summer. We are excited to see how they apply the knowledge that they have gained through tangible projects. Stay tuned for future updates this summer! We have cobbled together resources to run YLJ over the past few months. We received no significant foundation funding and have relied almost entirely on individual financial and in kind donations to make the program happen. We at Project NIA have volunteered our time to plan and co-facilitate this program because we are committed to youth leadership development. However, there are program costs that we have incurred including food and stipends for participants. We are still fundraising to support our work. If you are able and feel moved, please make a donation HERE today. All donations are tax-deductible to full extent of the law. The trend of harsh school discipline practices such as suspension, expulsions, and zero tolerance policies in public schools do more to increase student involvement in the criminal punishment system than to correct or curb behavior. Research suggests that when students are suspended or expelled, the likelihood that they will repeat a grade, not graduate, and/or become involved in the juvenile justice system increases significantly. In Chicago, Black students and children with special education needs are suspended and expelled at particularly high rates. 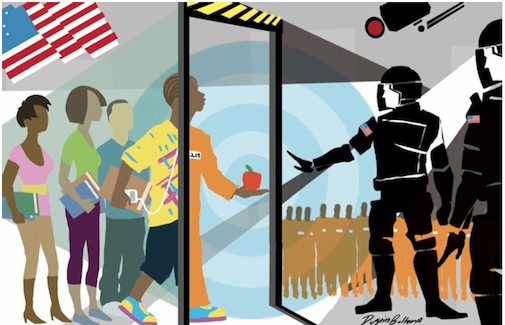 Join Mariame Kaba, Director of Project NIA, for “Understanding the STPP,” an introductory workshop about the impact of school discipline policies and solutions to dismantling the School-to-Prison Pipeline (STPP). Participants will leave the workshop with an understanding of Chicago-specific school discipline data and an overview of how the STPP operates. This is an INTRODUCTORY workshop appropriate for people who do not have much knowledge about the dynamics of the STPP. For those who are very familiar with the STPP & are looking for curriculum ideas, etc…, visit the Suspension Stories website. Mariame is co-author of the reports “Policing Chicago Public Schools. She has also co-authored essays about the school-to-prison pipeline as well as restorative justice including: Arresting the Carceral State (with Erica Meiners) and Restorative Justice is Not Enough: School-Based Interventions in the Carceral State (with Hereth, Lewis, and Meiners). Time: 1 to 4:00 p.m.
Info: Bring your lunch. This workshop is at no cost to participants. However space is limited and Pre-Registration is REQUIRED. NO WALK-INS WILL BE ACCEPTED. We also ask that you please be considerate of others who would really like to attend this workshop. DO NOT SIGN UP WITHOUT BEING CERTAIN THAT YOU WILL ATTEND. We really mean this. You can also find information HERE. October 11 – “Reparations On My Soul”: Opening Reception and Conversation – 6 to 9 pm, Art In These Times 2040 N. Milwaukee Ave.
A new exhibit by the Chicago Torture Justice Memorials at Art In These Times, explores reparations as a meaningful act of redress for over 100 African American men who were systematically tortured by former Commander Jon Burge and other white detectives under his command on the South Side of Chicago. Displaying works by local and national artists that imagine speculative memorials recalling the city’s history of police torture and the struggle against it, this exhibit honors the survivors of torture, their families and the African American communities affected by the torture. 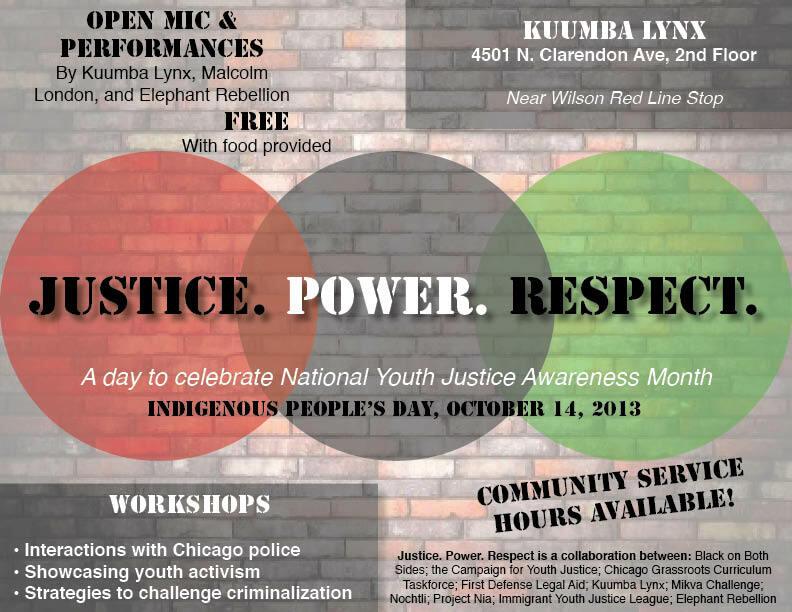 In celebration of National Youth Justice Awareness month, a number of organizations have gather together to address the harm caused by traumatic interactions with Chicago police, youth criminalization and celebrate our struggle to build justice, power and respect. This event includes workshops, discussion, open mike and other performances. It is FREE with food provided. Youth participation is particularly welcome to attend. A multidisciplinary program and discussion featuring community activists, and Columbia faculty, staff, and students. The event is FREE. October 18 – Perspectives From A Life Held Captive, 6-9pm Threewalls Gallery, 119 N. Peoria St.
Join us for a one night event of music, readings and a silent auction to support future projects and classes. Threewalls Gallery is walking distance from the Morgan stop on the Pink and Green Line, and near the Randolph St. exit on 90/94 fwy. Join the Prison and Neighborhood Arts Project for music, readings and a silent auction to support future projects and classes. You can also view an exhibition of creative work from a year of classes and collaborations between free and incarcerated artists, scholars and writers at Stateville Prison. Join Sage Community Health Collective for a Roundtable Discussion about healing from trauma and the role internalized oppression has on our healing process. Mariame Kaba, Director of Project Nia will facilitate, focusing on questions such as : What are the connections between healing generation trauma, violence in our communities, and internalized oppression? How does it affect our work, family and personal lives? How do we get away from blaming and shaming ourselves throughout the healing process? Participants are invited to come discuss and share stories of how we heal. Join Project Nia for a Community Share, free healing event. On October 19 from 2 – 4 pm, various community members will gather at Family Matters in Rogers Park. People are invited to receive free short healing treatments and also to share their own healing skills with others. (You don’t have to share any skills in order to come and enjoy the event — you can simply come to receive). There will be massage, movement therapies, reiki energy healing, hypnosis, yoga and stretching, and ear acupressure, among others. Last month Mayor Rahm Emmanuel said decades of torture by police officers of African American suspects under former Police Commander Jon Burge was a “dark chapter in the history of the city of Chicago” and a “stain on the city’s reputation.” But has justice been done? What would reparations for Burge’s victims look like? View the new exhibit “Reparations On My Soul” and join the In These Times “Hot Off the Press Party” after this conversation with Flint Taylor, founding partner of the People’s Law Office. 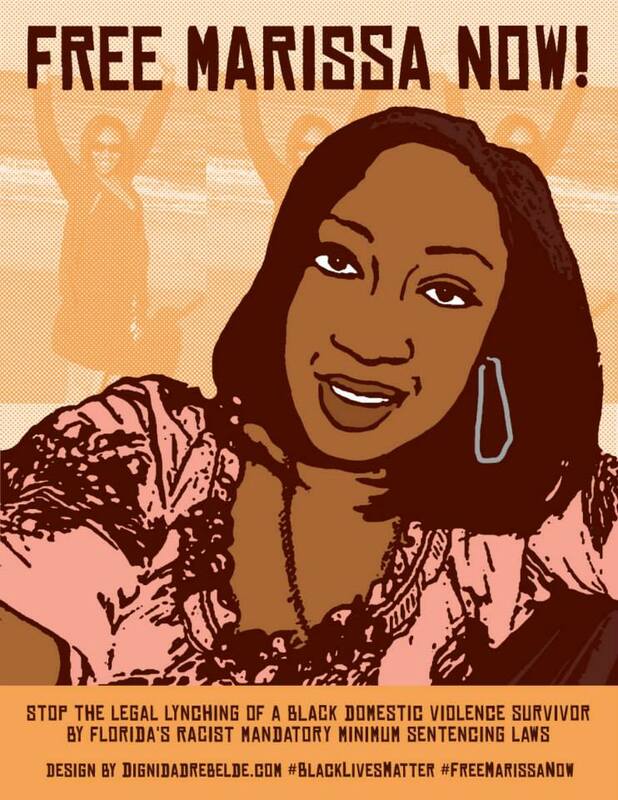 October 28 – Potluck & Candlelight Vigil for Marissa Alexander – 6 to 8:30 p.m. Hull House Museum, 800 S. Halsted – Details are HERE. Join Building Communities, Ending Violence for creative arts as responses to everyday oppression and violence (including transformative justice note card making), mini workshops, and open mic for poetry, spoken word, music, and performance. And we’ll have refreshments and delicious foods to share! This event is FREE. Join us as we discuss the impact(s) of prison on children and address ways to explain it to them. This event is relevant for families with incarcerated loved ones and individuals who work with children of the incarcerated (as educators, caregivers, or service providers). November 10 – Film Screening: Natural Life — 3 p.m. Location: Hull House Museum, Dining Hall, 800 S. Halsted Street. This screening is followed by a discussion moderated by Jill Petty with Tirtza Even, artist and filmmaker, Mariame Kaba, Project NIA Director, and Shobha Mahadev, Project Director of the Illinois Coalition for the Fair Sentencing of Children. This event is FREE. Join Project NIA & Free Write Jail Arts Program for an exhibition that asks everyone to imagine a world without prisons. The exhibition runs from 11/11 to 12/9 at the Human Thread Gallery. Submissions for the exhibition will be accepted until October 15th. Details are HERE. November 16 – Prison Impact: Roundtable Discussion – 3 pm – LOCATION TBD. 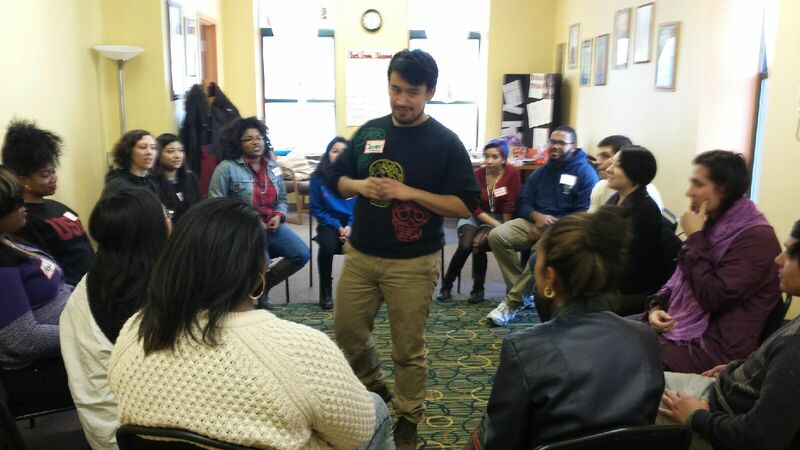 A conversation with movement organizers on working and resisting within a carceral state. This discussion moderated by Erica Meiners features Chicago Anti-Eviction Campaign, Moratorium on Deportations, Evan Lyon (Department of Medicine faculty, University of Chicago), Charity Tolliver (Black Thought, Black Action), Benny Lee (National Alliance for the Empowerment of Formerly Incarcerated People). A workshop will follow in which attendees will be encouraged to imagine reallocating the State’s nearly $1.3 billion Department of Corrections 2013 budget. December 4 — The Art of Giving at the HumanThread Gallery in the Bridgeport Art Center, 1200 W. 35th street. The Art of Giving is an opportunity to create art while still reflecting, recognizing and remembering the young people incarcerated in the Juvenile Temporary Detention Center (JTDC). This event will be happening during the powerful Picturing A World Without Prisons: Images, Words, & Sounds exhibit. We will be screen printing, making cards for youth and other great arts/crafts projects. All we ask is for a donation of item(s) requested by youth at the JTDC, you can find the list below as well as on the flyer attached. If you are unable to join us for the event and would still like to donate please feel free to contact Jenine at jenine@illinoissafeschools.org. Please, RSVP at our Eventbrite or on our Facebook Page. December 5 — Everyday Responses to Everyday Harassment — 6 to 9 pm, DePaul University, Lincoln Park Campus — (2320 N. Kenmore; take elevators right inside door to 3rd Floor, Levan 308) – Join Building Bridges, Ending Violence for this strategy session focused on building community accountability for interrupting violence. For further information, contact: arusso@depaul.edu. This event is FREE. We will gladly keep adding to this calendar of events so please feel free to email us at projectnia@hotmail.com with more information. 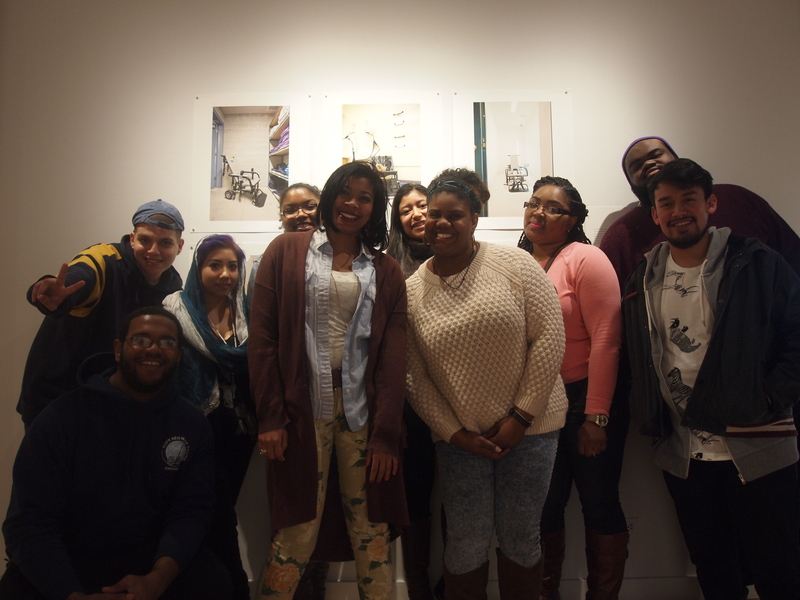 On the occasion of Marissa Alexander’s 33rd birthday, we hosted a teach-in about her case in the context of others involving women of color who were criminalized for defending from violence. Even before we facilitated the teach-in we were asked by others if we could share the curriculum and materials with them. A big part of our work at Project NIA is focused on making information readily available in the spirit of collaboration and a desire for a more just world. As such, we are making the curriculum and materials that were developed by Mariame Kaba freely available. Please feel free to adapt the materials however you choose. We only ask that you make sure to credit Project NIA for the materials as you use them. In addition, please be aware that this curriculum was only offered once and is a work in progress. The feedback was very positive but we would definitely appreciate it if you would share any improvements you make to the curriculum. We would love to keep adding to it and sharing what you develop with others too. We will happily upload your materials here for others to use. WORKSHOP OUTLINE & TEMPLATE — DOWNLOAD PDF. The following is a handout developed by the Free Marissa Now Campaign with a list of ACTIONS that folks can take to support her. If you are going to facilitate this teach-in, I suggest that you read this STATEMENT ABOUT MANDATORY MINIMUM SENTENCING (PDF) and its intersection with domestic violence and racism developed by the Free Marissa Now Campaign. It would also be a good resource for teach-in participants as well. Facilitators might also want to read the statement of Incite! calling for the freedom of Marissa Alexander. The statement does a terrific job underscoring the social forces that led to her criminalization while also showing how to do intersectional analysis. The National Coalition against Domestic Violence can also provide facilitators with background information that might be helpful (this is especially true if you don’t have a grounding in the dynamics of DV). Finally, I encourage facilitators who are new to thinking about the Prison Industrial Complex to read through The PIC Is which is a zine that was developed by us and the Chicago PIC Teaching Collective. It’s a quick read and provides a brief intro to the PIC. Good luck! If you have any questions, feel free to address them to Mariame at projectnia@hotmail.com. Today, we officially kick off Chicago Transformative Justice Fall with a new resource/curriculum guide that was created by Billy Dee and Mariame Kaba with contributions by Micah Bazant, Ann Russo, and Lewis Wallace. 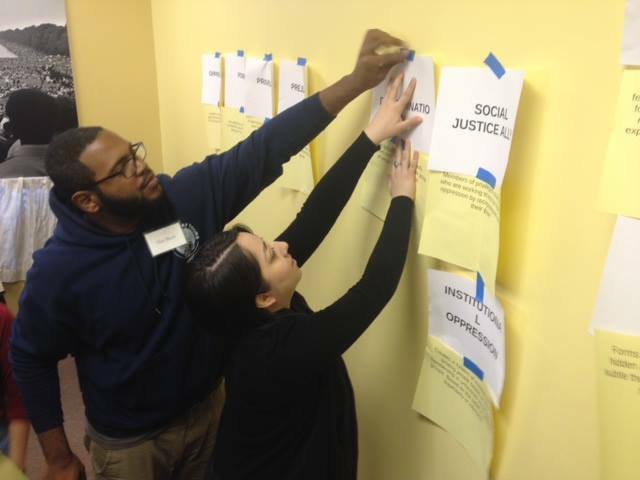 The transformative justice curriculum guide (PDF) offers some idea for educators, organizers, and community members who want to facilitate conversations about concepts such as intervening when harms occur, how to define justice, forgiveness, alternatives to policing, and more. We hope that you will use the ideas included in the guide to facilitate rich discussions in your chosen communities. We also hope that you will link the ideas addressed in the guide to concrete actions that you are or might take to transform harm and create more justice in the world. Finally, please make it a point to join us for the opening of our upcoming art exhibit that will meditate on topics such as justice, a world without prisons, and more on November 15th. We invite groups to make arrangements to visit during the course of the exhibition’s run. Please join Project NIA for a teach-in about the Marissa Alexander case and others focused on women of color who have made self-defense claims in response to violence directed at them. This teach-in is organized in solidarity with the call for nationwide rallies and other events focused on Marissa Alexander and her case. You can download a flier for the event HERE. Read the Incite! call to FREE MARISSA ALEXANDER for more context about this case. Since the jury declared its verdict of not-guilty in the George Zimmerman trial, many people have written excellent articles about Trayvon Martin, the legal case, the endemic racism in the nation’s institutions, and more. Everyone wanted to add their words to the conversation and as a result it felt like we were being inundated with commentary. 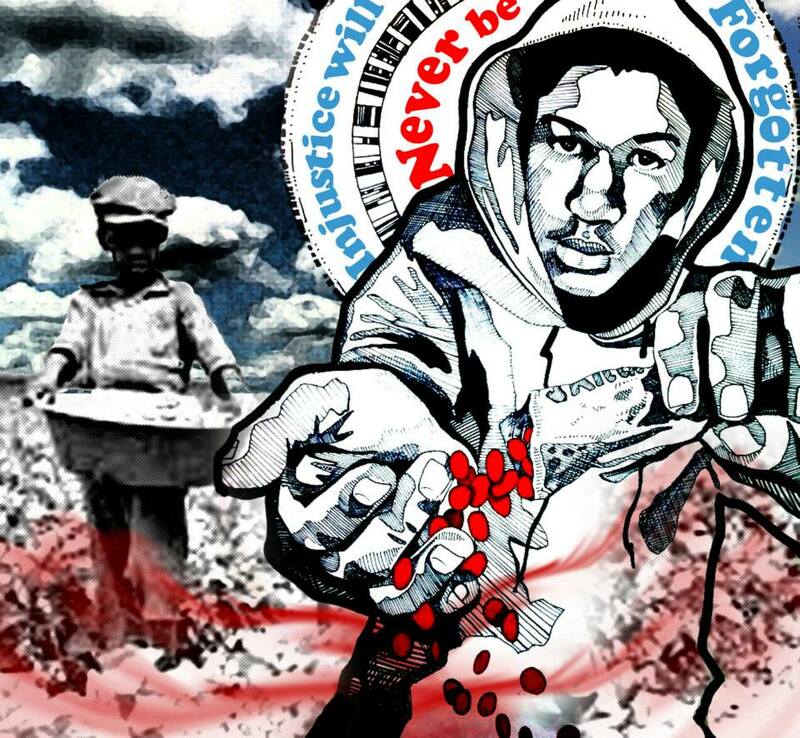 Because we work with young people, we decided to collect some of the writing that we found to be most affecting and most illuminating about the issues involved in the Trayvon Martin case. We took care to include writing that would be accessible to young people with an 8th grade reading level. This publication is appropriate for high school aged youth and older. It includes articles, manifestos, and a couple of poems. At the end, we offer a short list of potential activities and actions that young people can do. You can download the reader HERE (PDF). Special thanks to Victoria Law who suggested some of the articles to include in this publication and to Antonia Clifford who answered our call for a volunteer graphic designer. We hope that you find this resource helpful. Free. Please share with youth and adults communities. Facilitated by Prudence Brown and Danton Floyd. Speakers include Malcolm X College Professor Abra Johnson, author and writer for The Gaurdian, Gary Younge. What has been the role of mainstream media in framing or distorting the case? How does this case fit into the larger frame of the growing prison industry, criminalization of Black and Brown youth, and the escalating problem of gun violence? What are the lessons about the mechanisms of change or the limits of certain mechanisms for change – how effective are mass pressure/ mobilization? Petitions? Art? The court system? Social media? What would “justice” look like in this case, especially given there is such widespread criticism of incarceration as a solution? 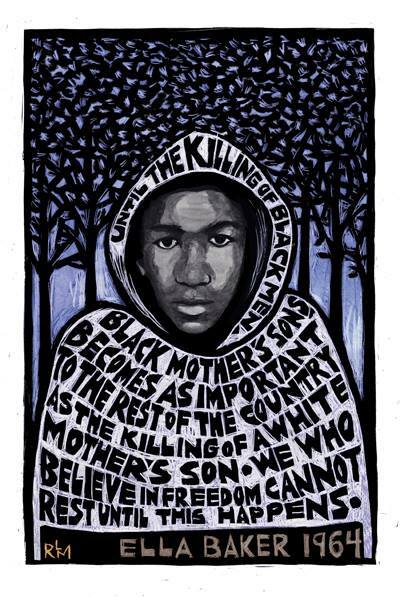 How do prison abolitionists respond to the George Zimmerman trial? Additionally we will collectively explore the implications of the Martin murder and Zimmerman acquittal in light of the ongoing crises of violence, school closings and deteriorating life chances for Black and Brown youth in Chicago. This will be an interactive teach-in with resources and information provided in multiple formats. Co-conveners: Charity Tolliver, Lisa Brock, Tracye Matthews, Cathy Cohen, Jasson Perez, David Stovall, Barbara Ransby, Danton Floyd, Mia Henry, Asha Ransby-Sporn, Mariame Kaba, FM Supreme, Alice Kim, Rev. Janette Wilson, Kevin Coval, Isis Ferguson, Lisa Yun Lee, Touissaint Losier, Deana Lewis, Lynette Jackson, James Thindwa, Martha Biondi, Fresco Steez.